Nothing can outclass SEMrush projects. 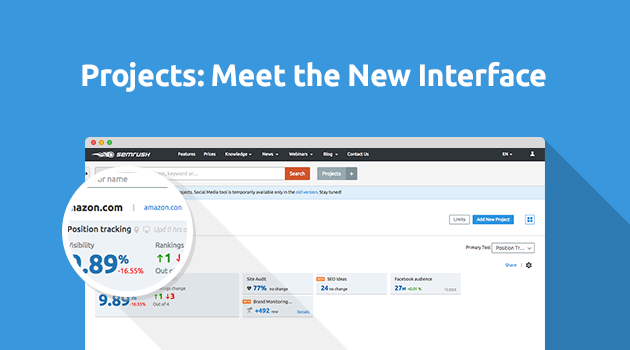 Oh wait, there’s actually one thing that can — our new SEMrush projects! Feast your eyes on the updated version of Projects. Let’s see what’s different about our improved interface. As usual, SEMrush Projects will continue to carefully store all your campaigns launched to analyze domains’ performance with different tools. However, we put a lot of effort into improving the user’s interface loading speed in order to deliver results and numbers in a heartbeat. Let us know if you noticed any difference. The most distinctive feature of the new Projects interface is its new close-knit layout: all numerical data for each tool is compactly arranged within a single widget. You can now set a Primary tool – the one that’s most important to your campaign. The data for this tool will now be displayed in a larger widget at the far left side of the interface. For instance, if you chose the Site Audit tool as your primary tool, you’ll see your site’s health score, the number of pages with issues and how those issues have changed over time. If you hover over any section of the widget, you’ll see a ‘Settings’ icon. The options available here will vary depending on the tool itself. The main purpose of this icon is to reduce iterations and make campaign details easily accessible. To delete or rename your project, click on the ‘Settings’ icon at the top-right corner of each project. In case you’ve reached your limit on the number of projects you can create or the number of keywords you can track, there’s a ‘Limits’ button at the top right corner. Use it to increase your number of projects or keywords. The rest is pretty much the same: you can search for a project by URL or name and start a new project by clicking the ‘Add New Project’ button. [email protected] with your comments and suggestions.